RightNote is an easy to use notes organizer and information manager that allows you to store and organize different types of information in a single place and find that information very quickly. Handle information more efficiently and productively. What is RightNote and how can it help you? Here's a quick explanation: We all have to deal with bits and pieces of information on a daily basis: phone numbers of contacts, passwords, to-do lists, webpage snippets, research papers, accounting information, browser bookmarks, source code snippets etc..etc.. How do you deal with it all? If you write things down on little pieces of paper or store this information in different files scattered on your computer, it wont be long before you run into the following problems: (1) It's a (huge) bother trying to find something when you need to, having to sift through loads of information, (2) it's hard to backup your important information (since it is not stored in a single place) and (3) it's hard to protect sensitive information (e.g. credit card details). RightNote solves all these problems by allowing you to store all your information in a single place, find things ultra fast with full text search and highlighted search results, and protect sensitive information by putting a lock on selected notes. RightNote includes different types of notes to store different types of information. There's a word processing note for textual information and web clips, a spreadsheet note for accounting info or any type of list, and a source code note for source code snippets. All notes are stored in a hierarchical tree outline and can easily be moved around and re-organized at a later point. Well that is just a very short summary. RightNote includes a large number of features that help you deal with notes and information more efficiently, make your data more memorable and organized, and stimulate your brain with colors, icons and tags. 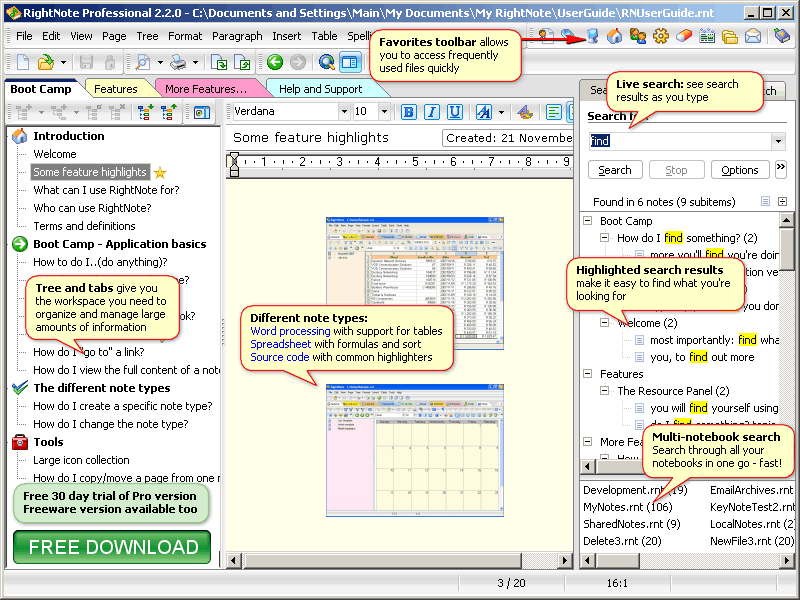 What's more, there's a freeware version that includes a large number of RightNote's main features. The best thing to do is download a free trial of the Professional version or start using the Freeware version today! Organize your events with events reminder. Just add important event and program will remind you with signal or your favorite music. Moo calendar is a stylish looking Windows calendar software supports Google and Yahoo calendar. It is featured with multiple calendars support, easy to generate and print agenda, handy TODO list and integrated wheather forcast. Program creates sticky notes on screen. You can store any information you need: tasks, appointments, birthdays, phone numbers, etc. All notes are stored in a single .ini file and does not use the registry. With Free Address Book you can note the addresses, phone numbers, mobile, fax, company name, country, city, website address and email addresses of your contacts and partners. You can easy print list of contacts and details of selected contact. DAISHO is the integrated productivity software for professionals: goal-, time- and task-management, contact management with CRM features, email client. Synchronization with Smartphones via www.daishosync.com. Runs from USB stick. Netbook Mode. Powerful and affordable Contact Management Software. Desktop Contact Manager is easy sales CRM contact management software for sales professionals and sales teams. iNameDays adds name days to your default iPhone, iPad or iPod Touch calendar, where you keep all your other information - NOT in an extra calendar. Choose among 13 different countries. Also Swedish week numbers are included. This site does not contain serial number, crack, keygen RightNote Freeware serial number : serial number is the simplest type of crack. A serial number(cdkey,product key,etc) is register the program as you may already know. a crack or keygen may contain harmful software. If you cannot find the exact version you want, just give it a try. for more information read .nfo/.txt/.diz file include in zipped file.